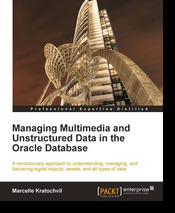 Today, I have a chance to review a good book about Oracle Database - Managing Multimedia and Unstructured Data in the Oracle Database by Marcelle Kratochvil. Author, she is CTO and co-founder of Piction, an Oracle PL/SQL based app that allows for the delivery of Images on the internet. Marcelle has been working in the IT industry for 20 years. In this time she has presented over 40 papers in Australia and the United States. Marcelle is both a DBA and Developer and has had experience using Oracle on MVS, VMS, Unix and Windows. She has worked on ultra-small databases to multi-terabyte sized ones. Marcelle has been using Oracle Multimedia since Oracle8, and has been using Oracle as a DBA and Developer since Oracle4. She also specialises in PL/SQL, Java, Gateways, Very Large Databases, Security and Database tuning. Her current focus is on Digital Imaging, Audio, Video, Spatial and all other types of binary object. As author wrote in a book , the aim of this book is to try and give a basic understanding to a lot of concepts involving unstructured data. Particular focus is given to multimedia (smart media or rich media). So, readers will get idea about Unstructured Data, Digital Objects, and many things. Anyway, if you are interested in increasing your knowledge and understanding more for multimedia, how to manage unstructured data and why you should use Oracle Database with unstructured data. This book fits for you, you are supposed to read it. This book has 10 chapters. You will learn. What do I think? Easy to read and clearly about digital data. Give good idea to manage unstructured data, show idea why there uses Oracle Database and learn from good examples. This book will give benefit for some people who are interested in managing multimedia and Unstructured data in the Oracle Database or increasing knowledge about Data Digital. This book covers about database tuning as well. This chapter helps DBAs learn new concepts, skills, and techniques that are required to manage very large multimedia databases. You also get idea to understand the limitations of oracle database with unstructured data.